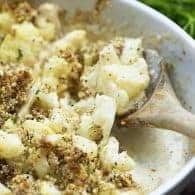 Cauliflower Mac and Cheese - this low carb recipe is perfect for keto! 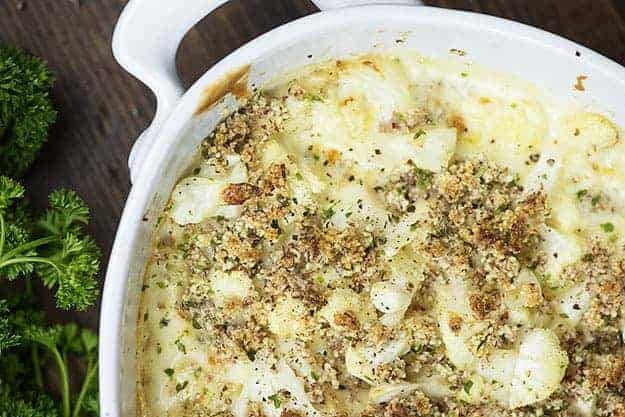 This cauliflower mac and cheese is going to be a hit with grown ups and kids alike – especially that low carb garlic bread topping! 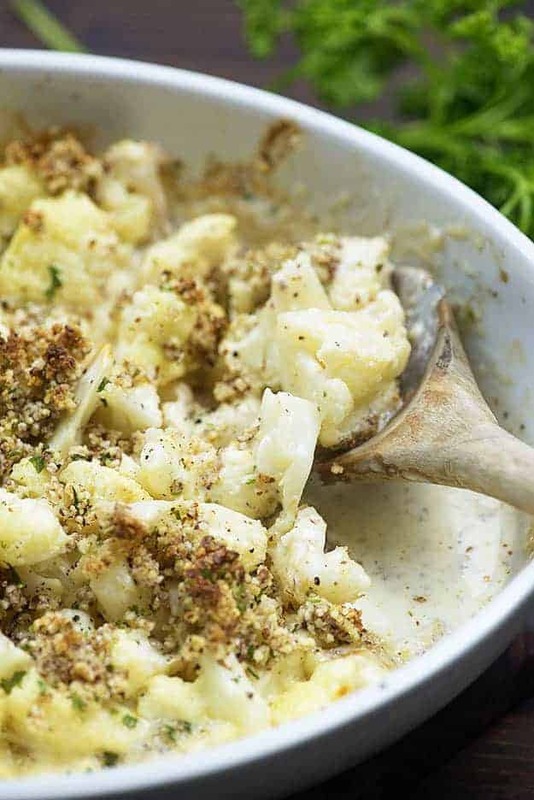 Skip the carbs and indulge with this creamy cheesy cauliflower instead. Big thanks to Roth Cheese for sponsoring this post. I totally realize that a lot of people are falling off of the New Year’s Diet Resolution band wagon, but I am so hopeful that this roasted cauliflower recipe is going to help keep you motivated on that low carb diet of yours. This recipe…woo. It does not taste like diet food, I can tell you that. 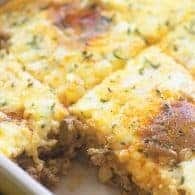 Then again, it’s not too often that keto recipes taste diet-y, which is probably why I love the keto diet so very, very much. It’s near and dear to my heart for three reasons – 1. Bacon, 2. Cheese, 3. Bacon and Cheese. 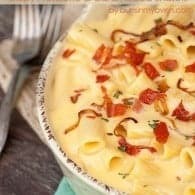 This keto mac and cheese is a family favorite. 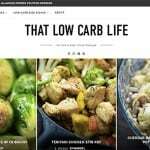 Honestly, it’s not too often that my family dislikes one of my low carb recipes, which really makes following the diet a whole heck of a lot easier! That’s not always true with other diets I’ve tried. 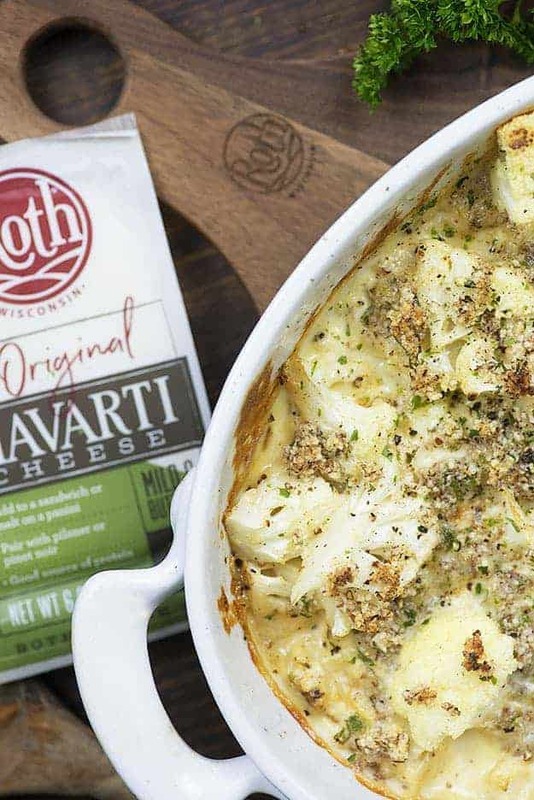 I teamed up with Roth Cheese to bring you this cheesy cauliflower bake and I think you’re going to love the mix of Grand Cru and Havarti cheese. If you haven’t tried Grand Cru before, it’s Roth’s signature alpine-style cheese. If you love Gruyere, you’ll love this cheese. 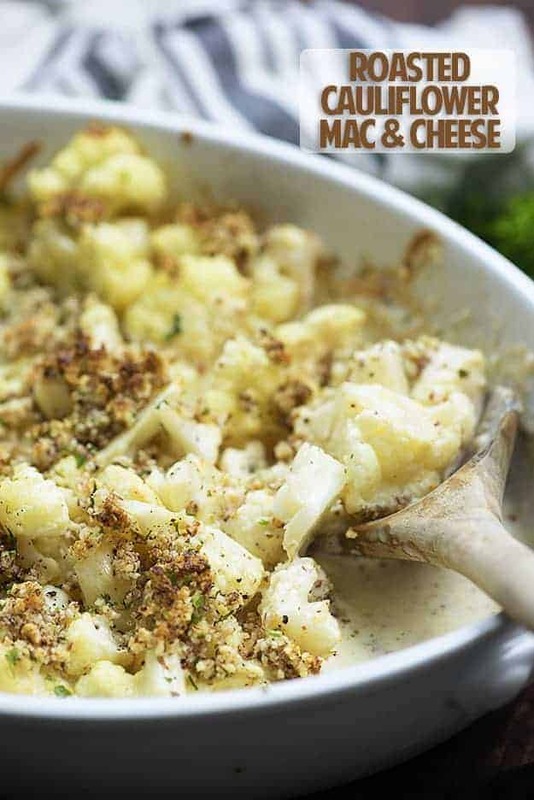 And who doesn’t love Gruyere, especially in a mac and cheese? Their Havarti is extra creamy and I have a really hard time not slicing it and serving it on a cheese board, but it’s really fantastic in a cheese sauce. 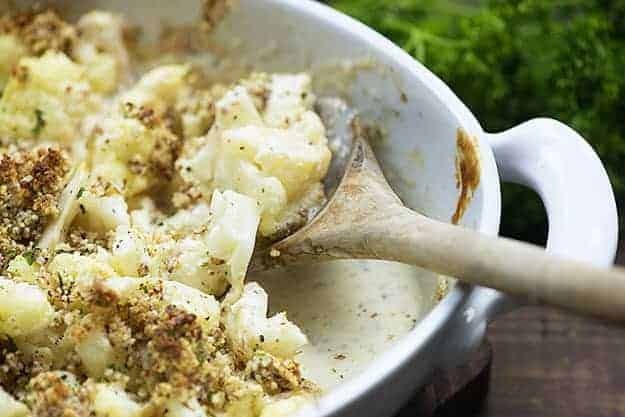 This low carb cheese sauce skips the traditional roux, since flour is full of carbs. 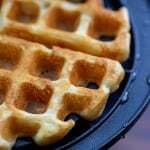 Instead, you’ll just heat some heavy cream and stir in your grated cheese until everything is smooth and creamy. Sam approach as you’d take for homemade alfredo sauce! I always add a bit of ground mustard powder to my cheese sauce for an extra boost of flavor, but if you don’t have it on hand, it’s fine to skip it. Ground nutmeg works well too. 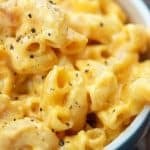 I really love how easy this keto mac and cheese recipe is and you can totally just stop right there and call it a day. However, I thought I’d take it a step further and add a garlic bread topping. I love crunchy toppings on baked mac and cheese, don’t you? 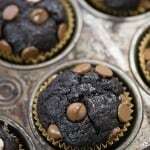 The topping is made of almond meal, butter, and garlic powder. So simple! 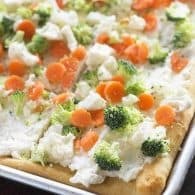 My kids barely even realized they were eating vegetables with this one! 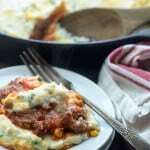 Hope you guys enjoy this cheesy cauliflower recipe just as much as we did! 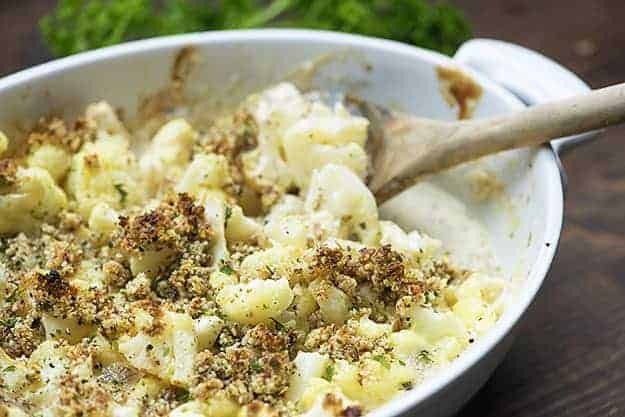 This cauliflower mac and cheese is made with a low carb cheese sauce and topped with a simple garlic bread topping to add a little crunch. This one is a hit with kids and grown ups alike! Dice the cauliflower into bite-sized chunks. Toss the cauliflower with olive oil, salt, and pepper, and place in a 2 quart baking dish. While cauliflower is baking, prepare the cheese sauce. 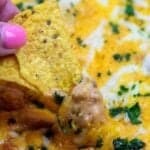 Heat the cream in a small sauce pan over medium heat and whisk in the cheeses and ground mustard. 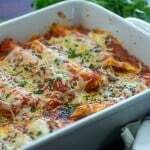 Continue whisking over medium heat until cheese has melted and sauce is smooth and creamy. Remove the cauliflower from the oven and pour the cheese sauce over the top. Stir to coat all of the cauliflower in the cheese sauce. 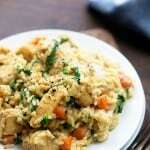 Stir together the almond meal, melted butter, parsley, garlic powder, and garlic salt. Sprinkle over the cauliflower mixture. Turn the oven to broil and return the cauliflower to the oven. Broil for 1-2 minutes or until the almond meal is browned. This dsh looks mouthwatering. 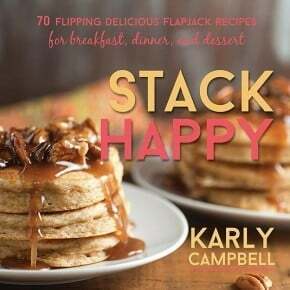 Will be making soon. Yum! I”m going to try this ASAP! Looks yummy. This one intrigues me and look s pretty darn amazing Karly. Thanks! So mac and cheese without the mac? I am totally in. I have been seeing cauliflowers on SUPER sale at the grocery store, and I have always been tempted to buy some, even though I had nothing in mind. Now I do!! great grown up mac and cheese, I don’t think havarti or grand cru is in kids version reight? and with all that cheese, there’s no need for pasta, cauliflower works almost seamlessly so thank you for wonderful recipe! I was going to make the cauliflower Mac and cheese. I found Roth Havarti at the price of $8.00 for 6 oz. this price is too much for my family. I couldn’t find Roth Grand Cru. Is there a substitute cheese that doesn’t cost so much, and is easier to find. The nutrition information is calculated on this being 6 servings. This looks fantastic! And your site is beautiful! Is there a general rule for serving size? I’m not sure what you mean by a general rule, but this recipe’s nutrition was calculated based on this making 6 servings.